Peter Havlik is Senior Economist and former Deputy Director at The Vienna Institute for International Economic Studies (wiiw) and Guest research scholar at the International Institute for Applied Systems Analysis (IIASA). His main research areas currently cover economic transition in Central and Eastern Europe, foreign trade, competitiveness, EU integration, EU-Russian relations and analysis and forecasts of macroeconomic developments. He is also country expert for Russia, North Macedonia and the Newly Independent States (NIS) at wiiw. 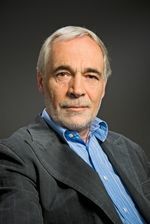 During his career he participated in and coordinated various large projects, for instance ‘Industrial Restructuring in the NIS: experiences of and lessons from the new EU Member States (INDEUNIS), funded by the EU Sixth Framework Programme (2005-2007), on ‘European energy security‘ (2008-2010) and ‘Trade integration in the CIS‘ (2011-2012) for the OENB Jubilee fund. He has also contributed to and coordinated various chapters of the EU Competitiveness Reports (2003, 2009, 2012, 2013) and recently coordinated the Work Package ‘Economic Developments and Structural Change in the Process of Transition and EU Membership‘ within the international FP7 research project GRINCOH.